Holy God, holy and mighty, who hast called us together into one communion and fellowship: Open our eyes, we pray thee, as you opened the eyes of thy servant Tikhon, that we may see the faithfulness of others as we strive to be steadfast in the faith delivered unto us, that the world may see and know Thee; through Jesus Christ our Lord, to whom, with thee and the Holy Spirit, be glory and praise unto ages of ages. Amen. Holy God, holy and mighty, you call us together into one communion and fellowship: Open our eyes, we pray, as you opened the eyes of your servant Tikhon, that we may see the faithfulness of others as we strive to be steadfast in the faith delivered to us, that the world may see and know you; through Jesus Christ our Lord, to whom, with you and the Holy Spirit, be glory and praise unto ages of ages. Amen. Saint Tikhon of Moscow (January 19, 1865 - April 7, 1925), born Vasily Ivanovich Belavin, was the Patriarch of Moscow and All Russia of the Russian Orthodox Church during the early years of the Soviet Union, 1917 through 1925. From 1878 to 1883, Vasily studied at the Pskov Theological Seminary. In 1888, at the age of 23, he graduated from the St. Petersburg Theological Academy as a layman. He then returned to the Pskov Seminary and became an instructor of Moral and Dogmatic Theology. In 1891, at the age of 26, he took monastic vows and was given the name Tikhon in honor of St. Tikhon of Zadonsk. Tikhon was consecrated Bishop of Lublin on October 19, 1897. On September 14, 1898, Bishop Tikhon was made Bishop of the Aleutians and Alaska. As head of the Russian Orthodox Church in America he reorganized the diocese and changed its name from "Diocese of the Aleutians and Alaska" to "Diocese of the Aleutians and North America" in 1900. While living in the United States Archbishop Tikhon was made a citizen of the United States. In 1907, he returned to Russia, and was appointed Bishop of Yaroslavl. St. Tikhon was transferred to Vilnius, Lithuania on December 22, 1913. On June 21, 1917, he was elected the ruling bishop of Moscow by the Diocesan Congress of clergy and laity. 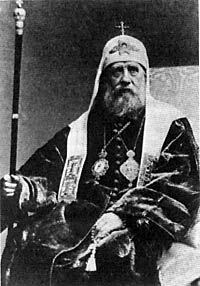 On August 15, 1917, Archbishop Tikhon was raised to the dignity of Metropolitan of Moscow. On November 5 of the same year, after an election as one of the three candidates for the Patriarchate, Metropolitan Vladimir of Kiev announced that Metropolitan Tikhon had been selected for the position after a drawing of lots as the new Patriarch of the Russian Orthodox Church. During the Russian Civil War the Patriarch was widely seen as anti-Bolshevik and many members of Orthodox clergy were jailed or executed by the new regime. Tikhon openly condemned the killings of the tsar's family in 1918, and protested against violent attacks by the Bolsheviks on the Church. After the establishment of the USSR the Patriarch was accused of being a saboteur by the Communist government, for which he was imprisoned from April 1922 until June 1923 in Donskoy Monastery. Among acts incriminated to him was his public protest against nationalization of the property of the Church. This persecution caused international resonance and was a subject of several notes to the Soviet government. Under pressure, Patriarch Tikhon issued several messages to the believers, in which he stated in part that he is "no longer an enemy to the Soviet power". Despite his declaration of loyalty, he continued to enjoy the trust of the Orthodox community in Russia. In 1924 the Patriarch fell ill and was hospitalized. On 5 April 1925, he served his last Divine Liturgy, and died two days later. He was considered a martyr for the faith. He was glorified a saint by the Russian Orthodox Church in 1989. This canonisation process is generally considered an example of the thaw in Church-Soviet relations in the Glasnost era. Tikhon's relics may be revered at the Donskoy Monastery of Moscow.